For older fans who had been tracking the band's evolution for decades, the exuberant resurgence of the Grateful Dead in 1989 was a wonderful bonus, like wine of a classic vintage that had become even more delicious in just a short time. Much of the credit for this late-career renaissance goes to Jerry Garcia, who seemed determined to come back stronger after surviving a near-fatal diabetic coma in '86. As the Dead played to bigger audiences than ever--the result of having a hit single, "Touch of Grey," followed by an MTV tribute that introduced the band to a whole new generation of Dead Heads--Jerry seemed to be sculpting his guitar lines with greater urgency, and putting more passion and precision into his vocal delivery too. It was as if his brush with the void had been a powerful reminder that "there's nothing you can hold for very long." As Jerry told interviewer Legs McNeil, "When I was in the hospital with tubes in me everywhere--with this machine slurching and things beeping and monitoring stuff--I [could] think of a million things I'd rather be doing than lying in a hospital bed. No more of that." This renewed and revitalized Jerry might even grin during a solo, dance a little two-step during a jam, and exchange conspiratorial glances with Brent Mydland, the band's fiery young keyboardist. Though Jerry likes to say that the Dead didn't have a leader, he had the virtue of all great bandleaders, which is the ability to make other players' contributions sound even more brilliant by adding his own. When he was playing well, the whole band became more inspired. Phil Lesh was having his own personal renaissance that year as well. On September 4--a couple of weeks after the band's thrilling final run at the Greek Theater in Berkeley--Phil and his wife Jill gave birth to Brian, their second son. The shows chronicled on Crimson, White & Indigo, Truckin' Up to Buffalo, Nightfall of Diamonds, Downhill From Here, and Without A Net capture the group at a creative peak that rivals any that came before it. For young Heads who hopped on the caravan after hearing "Touch of Grey," the tours from the summer of '89 until the spring of '90 made good on the promise that the show you saw in your hometown might be one of the best in Dead history. The band's decision that October to bring "Dark Star" back into the mix seemed to advertise that fact, but there was a lot more going on than a revival of cosmic oldies-but-goodies. The Dead had dozens of new colors in its palette courtesy of MIDI, a technology that enabled each of the players to tap into a library of sampled and altered sounds. Guitarist Bob Weir now had saxes and marimbas at his command, while Mickey Hart's drumsticks could summon fog horns, a merry-go-round, or even a lick of Jimi Hendrix. Jerry, on the other hand, favored the sound of an orchestra playing the same note in unison. Standing at the center of this maelstrom was one of the band's audio geniuses-in-residence, Bob Bralove, who earned his chops teaching Stevie Wonder's keyboards to respond to voice commands. The key to his role in the Dead, he says, was to ensure that "the musical character and consciousness of sound of each individual player dominated the technology, instead of the other way around. Inspired by their extracurricular excursions with rhythm masters Zakir Hussain, and Babatunde Olatunji, Mickey and Bill Kreutzmann's duets in the second set became a cloud chamber of sounds as melodic as they were percussive. Christening these journeys into the unknown "Big Hair" because they made your hair stand on end), the drummers probed sonic realms both ancient (like the goat-skinned tar) and worthy of science fiction (like The Beam, an aluminum contraption that could make Madison Square Garden tremble). This fusion of shamanistic tradition and digital manipulation sounded like the future of music--and it was. 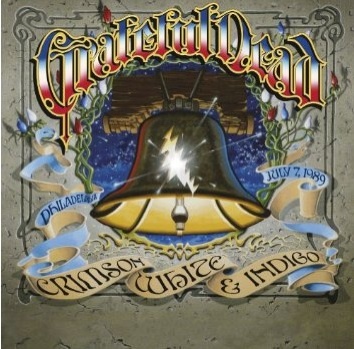 One reason that the jamming in this era seemed particularly fluid and concise was that the Dead were recording Built To Last, the follow-up to In The Dark. Alas, the final product sounded stiff and airless compared to its predecessor, which may have been a blessing, because the sheer magnitude of the Dead Head circus was already posing serious problems for the band. But the effort of making a new record brought worthy additions to the setlist like "Foolish Heart," a wry rocker about the perils of romance, and "Standing On The Moon," an aching ballad about isolation that ended with a shout-out to many Head's adopted hometown of San Francisco. Predictably, while the band seemed to be thriving, dynamics behind the "laminated curtain" weren't as smooth as they appeared. Jerry's commitment to staying off the drugs that were destroying his health proved to be short-lived. Phil was unhappy with the size of the venues required to accommodate the crowds in what he called "the MegaDead era." Brent's troubled marriage would end in divorce by the fall, which added to his ravaging lack of self-confidence and substance-abuse issues. These problems would lead to the keyboardist's tragic death from an overdose in July of '90. For a period of more than a year, however--culminating in the majestic performance of "Eyes of the World" with Branford Marsalis on Without A Net--the Grateful Dead was firing on all cylinders, like a sleek, streamlined locomotive heading into the future. That train steamed into John F. Kennedy Stadium in Philly on July 7, one of the hottest days of the summer. There was a lot of history in those concrete walls, including an infamous 1927 heavyweight title bout that ended with a bruised Jack Dempsey telling his wife, "Honey, I forgot to duck." But by '89, the arena was literally crumbling. The Dead's encore would be the final appearance there by any performer, as the venue was slated for demolition. Tents sprang up all over Philly as tourheads started arriving from the Truckin' Up To Buffalo show three nights earlier. When the gates of JFK opened, more than 100,000 sweaty hippies streamed in, some still dripping from a dip in a nearby pool. It was so sweltering inside that security guards offered to spray Heads with hoses to cool them down. After a soulful opening set by Bruce Hornsby and The Range, the Dead walked onstage and proceeded to blow the non-existent roof off the arena, starting with the first notes of "Hell In A Bucket." Hearing "Iko Iko" so early in a show was a treat, and the audience launched a flotilla of beach balls in the air. By the time Brent took a verse of "Little Red Rooster," it was clear that the keyboardist was in a feisty mood. This lit a fire under Jerry, who belted out "Ramble On Rose" with extra gusto. Elemental Grateful Dead physics at work: a surge of energy from any player could trigger a chain reaction that instantly spread to the audience and then back to the stage. Ripping versions of Dylan's "Stuck Inside Of Mobile With The Memphis Blues Again" and "Loser" came next, played with such abandon that the band was flirting with the edge of chaos. "Let It Grow," which always had tremendous jamming potential, was an absolute monster. But the most poignant moment in the set was yet to come. With the last chords of the jam still ringing in the muggy air, Jerry led the band into a tune Brent wrote with John Barlow called "Blow Away." Like most of Brent's songs, it opened a window into a darkness he wrestled with daily in his soul. "You must mean water when you get on your knees and beg me for blood!" This particular version of the song got more forceful with each repetition of the hook, like an avalanche poised to come roaring down a mountain. Finally the tension built up to the point where it was almost unbearable. Then Brent shouted: "Wait a minute!" It was his moment. The avalanche just stopped, frozen in mid-air behind him---as it had stopped for Pigpen as times like this--because Brent had something he needed to talk about. "There's been something I been tryin' to get through to you, so listen closer than you ever listened close in your life before. Listen up. You got something held in your fist. You got your first held tight, you're holdin' on tight. What you think is love ain't." Brent kept going, talking about holding love close to your chest so tightly that your fingers turn blue. "I mean, what do you think your rib cage is--a jail cell, mama?" It was so raw. Brent may have been a guy in pain, but he sure didn't sound like a young man who had only a little more than a year to live. "Do you want to know real love? I'll show you real love. Real love you don't hold in your chest… So do me a favor now. Take that fist. Take that fist and hold it in the air!" Many people in the audience did exactly that. "Now open up that fist"--and thousands of fists unclenched. Just at that instant, a cool, refreshing breath out of nowhere passed over the heads of the crowd, breaking the long heat of day. "Feel that breeze--and let it blow away!" Everyone felt it: that Grateful Dead alchemy when all the dust of the world was blown away and your life could take a turn for the better. In that moment, my friend Tim Satterwhite, one of the thousands of kids filling the stands, understood why he would always be a Dead Head--because of something at the heart of the music that was much bigger than the players onstage, and bigger than the audience. "I saw that all six guys were like individual strings on the same instrument, playing something mathematically precise and beautiful at the same time," he says. "It felt like that Big Bang that created the Universe. I knew I was connected to everything and everyone else. I said to myself, 'Yes, this is it. That is what I am.'" And that was just the first set. This album was released in April 2010.